Oklahoma City, OK – April 10, 2012 – At an event honoring business innovation, entertainment retail auction website QuiBids.com was recently honored with a 2012 Journal Record Innovator of the Year award. The annual event and magazine recognize individuals and organizations that exemplify the innovative spirit in the state of Oklahoma. Non-profit organizations, biotechnology companies, agricultural enterprises and more are given awards and deserved attention for their creativity. Innovator of the Year honorees have taken a great idea and turned it into a functioning business. Honorees receive a special award and recognition at an annual awards dinner event, where one overall Innovator of the Year is named. QuiBids entertainment retail auctions are a unique, exciting way to rejuvenate a century-old traditional auction in the digital era. Their goal was to make an entertainment auction model that was as transparent as possible in order to help increase their users’ chances of reigning in on spectacular retail items. AliveCor won the overall 2012 Journal Record Innovator of the Year award at an event honoring the innovative businesses on Thursday, April 5th at the Renaissance Tulsa Hotel & Convention Center in Tulsa. 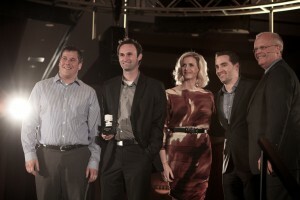 The Oklahoma City company received the overall Innovator award for its Smartphone ECG. For more information, visit QuiBids to read QuiBids reviews. QuiBids, pronounced (‘kwi-bids’) as in Quick Bids, is a fun and exciting auction website where you can win big ticket items at amazingly low prices. QuiBids began in July 2009 and has expanded with their improved internet auction model. QuiBids live auctions are more exciting, reliable and safer than other online auction websites. Based out of Oklahoma City, Oklahoma, our primary goal is simple: We are dedicated to providing an exciting online auction model with better deals for the consumer than any other website online.